The Melrose Library recently played host to Mrs. Claus and her helper, Mr. Elf at their annual Holiday Tree Party. PALATKA – The Putnam County libraries are busy this final month of 2017. An Ugly Christmas Sweater Contest is planned Friday, Dec. 15, at the Interlachen Library. Visit any time between 9:30 a.m. and 5 p.m. Photos will be taken throughout the day, and the winner will be announced at 5 p.m. The Interlachen Library is located at 133 N. CR 315. Call 386-684-1600 for information. Cookies with Santa will be spotlighted from 10 a.m. to noon Saturday, Dec. 16 at the Interlachen Library. Photos with Santa will also be featured. Cookies will be available on a first-come, first-served basis. 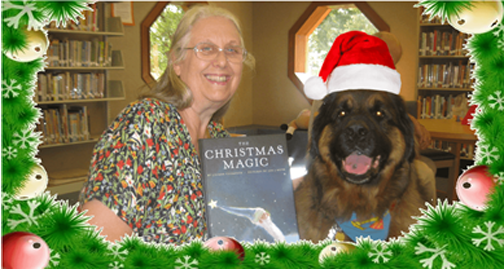 The Melrose Library will host a special holiday party in honor of Clyde the Wonder Dog from 11 a.m. to noon Saturday, Dec. 16. Cookie decorating and holiday games will be spotlighted. The Melrose Library is located at 312 Wynnwood Ave. Call 352-475-1237 for information. The Headquarters Palatka Library will host local author Diane E. Izzard at a “Lunch & Learn” on Thursday, Dec. 14 from 11:30am-1pm.Bring a brown bag lunch and socialize from 11:30 a.m. to noon. The presentation starts at noon with plenty of time after for questions. Diane is the author of the brand new book:Wildflowers by the River, a mystery set in Palatka. She has also written: The Path to Finding Happiness and Too Soon to Die. For information contact Jeremy Yates, 386-329-0126. The Headquarters Palatka Library is located at 601 College Road (close to the Florida School of Arts)..
Write a Letter to Santa and bring it to the Crescent City Library by Dec. 9 with your name and address and you will get a reply from the big guy himself! For more information, call the library at 386-698-2600. You can also get your Picture with Santa on Saturday, Dec.9 from 11 a,m. to 12:30 p.m..Personal cameras welcome. Sponsored by the Crescent City Library Board. The Crescent City Public Library is located at 610 N Summit Street(beside the Woman’s Club). Get a photo with Santa at the Headquarters Palatka Library (601 College Road) on Saturday, Dec. 9. Pre-registration is required and participation is limited to 150 spots. Call to reserve your time slot. There will be a photographer on hand (you are welcome to take your own picture too). Everybody will receive a free CD with digital copies of the photos to keep. This event is cosponsored by the Putnam County Parks and Recreation Department. Join the Putnam County Parks and Recreation Department for a “Movie in the Park” on Friday, Dec. 15 at 7pm at the Football Field on120 Carter Road in Palatka (John Theobold Sports Complex). Free entry and snacks. Please, bring your own chair/blanket. Co-sponsored by the Police Athletic League. BYOL (Bring Your Own Lunch) to the Interlachen Library the second Tuesday of the month from11:30am-1pm and learn something new! Tuesday, Dec. 12 a Pipe Cleaner Christmas Tree Ornaments class is planned, open to all and designed for ages 9 to 99. Materials will be supplied. Drinks are provided by the Friends of the Interlachen Library. Call 386-684-1600 for information. The Interlachen Library is located at 133 North County Road 315 – across from Interlachen High.